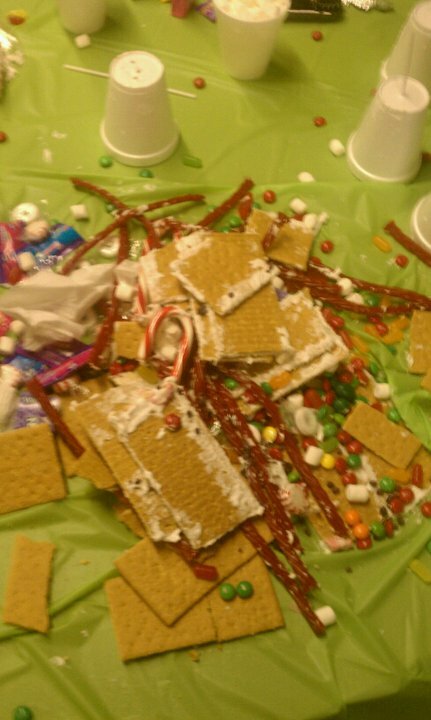 This entry was posted on December 9, 2010 at 4:24 pm and is filed under Food for thought with tags Gingerbread houses, good moms, gumdrops, holidays, Royal icing, stress, tradition, urgency. You can follow any responses to this entry through the RSS 2.0 feed. You can leave a response, or trackback from your own site. My mother-in-law bought a gingerbread house kit at COSTCO this year which came pre-assembled. 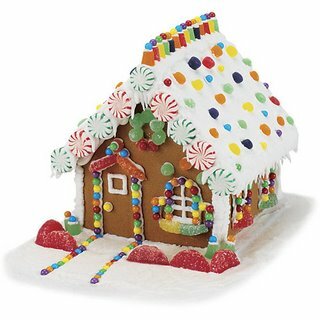 We just popped the already built house out of the box and decorated it with the supplied icing and candy. Even the icing was already mixed up, you just had to snip a corner off the bag to start piping. I couldn’t venture to say how much candy actually ended up on the house and how much ended up in my daughter’s stomach, but it was low stress, minimal mess, and she had fun. I was better at throwing it away than making it!! :)) Definitely harder than it looks! Yes! It was horrible! A lot harder than it looks. LOL, THAT IS TOO FUNNY, TYLER HAS ANOTHER MOMMA STORY TO TELL. You are a good mom to try that!